The widespread reports of malformed frogs have sparked interest worldwide to try and determine the causes of such malformations. Ribeiroia ondatrae is a digenetic trematode, which has been implicated as one such cause, as this parasite encysts within the developing tadpole hind limb bud and inguinal region causing dramatic limb malformations. Currently, the mechanisms involved in parasite-induced limb deformities remain unclear. We sought to investigate whether the level of retinoic acid (RA), a morphogenetic factor known to play a critical role in limb bud formation, is altered by the presence of R. ondatrae within the infected tadpole. Alteration of RA levels within the limb bud caused by the presence of the parasite may be achieved in three ways. First, metacercariae are actively secreting RA; second, cercariae, upon entering the limb/inguinal region, may release a large amount of RA; finally, the metacercariae may induce either an increase in the synthesis or a decrease in the degradation of the host’s endogenous retinoic acid levels. Here, we show through high performance liquid chromatography and mass spectrometry that limb bud tissue of Lithobates sylvaticus, which has been parasitised, contains 70% more RA compared to the unparasitised control. 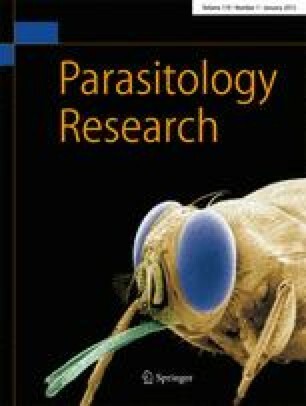 Furthermore, parasites that have encysted within the limb buds appear to contain substantially less RA (56%) than the free swimming cercariae (defined as the infectious stage of the parasite). Taken together, these data illustrate for the first time that encystment of R. ondatrae leads to an increase in RA levels in the tadpole limb bud and may offer insight into the mechanisms involved in parasite-induced limb deformities. D. Szuroczki and N. D. Vesprini shared primary authorship as both parties contributed equally to every aspect of this research. We would especially like to thank Alysen Lougheed for all of her help in the seemingly never ending snail hunt and preparation of samples and Amanda Lepp for her assistance in the earlier experimental design phase. We would also like thank Dr. Janet Koprivnikar for all of her valuable input on earlier drafts of the manuscript. This research was funded by the Department of Biological Sciences, Brock University and the Natural Sciences and Engineering Research Council (DG# 238373 to G.E.S and DG# 2802-07 to R.L.C).